Over the last few years there have been many advancements in online electricity monitoring technologies. 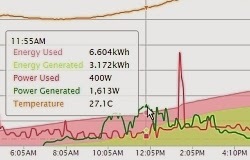 Now it is all very easy and affordable for the Aussie householder, to get home electricity consumption and solar power generation data online, for detailed analysis and alert purposes. A cloud based electricity monitoring solution, can display your electricity data in easy or complex display modes, making it the ideal choice to suit everyone's needs. If you are short of available time or the expertise required to getting your data online, at Aussie Home Energy we have an easy solution. We have bundled the electricity monitoring hardware with a setup service, making this a fast hassle free experience for you. Your choice of hardware, will be based on whether you are monitoring electricity consumption, or solar power, or both. The only other requirement affecting the choice of monitoring solution, will be based on the number of phases you have in each situation. All systems are preconfigured and tested to your requirements, before dispatch. These 'plug n play', online electricity monitoring systems, will allow you to see the data you need, in your face, online, or on your mobile device. Now there is nothing to stop you, from seeing the power you are generating, importing, using or exporting. Visit our ONLINE ELECTRICITY MONITORING page for all the latest information.